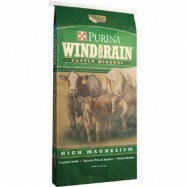 Purina High Magnesium Mineral for cattle is available now at Ark Country Store. Have your pastures suddenly become extra green after the recent rounds of rain? Get some peace of mind; protect your cattle from grass tetany this year and after every heavy rain by ensuring they get enough magnesium in their systems despite the lush, green pastures. Purina High Magnesium Mineral and other great products for all your animals can be found at your local Ark Country Store! Find out more about the cattle products we offer here. Watch this short video and stop by the store in Waxahachie or Midloathian today! This entry was posted on Tuesday, November 27th, 2018 at 10:52 am	and is filed under News & Updates. You can follow any responses to this entry through the RSS 2.0 feed. Both comments and pings are currently closed.